Things might look bleak right now, but there are plenty of catalysts on the horizon that could send this stock high. 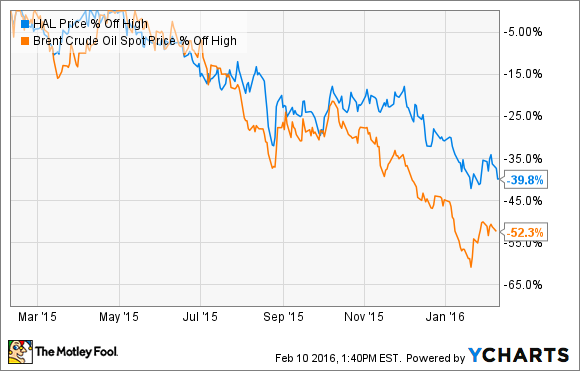 The oil market downturn has been tough on Halliburton (NYSE:HAL). Last year its revenue slumped 28%, while its adjusted income from operations plunged 61.8%. Industry conditions aren't expected to get much better anytime soon, which will likely put even more pressure on Halliburton's financials. Making matters worse, the company has had a real tough time convincing regulators to approve its merger with Baker Hughes (NYSE:BHI), which would have significant financial ramifications on Halliburton if the deal isn't consummated. That's why it's really no surprise to see that Halliburton's stock is down nearly 40% over the past year, with plenty of catalysts that could send it down even farther. However, bullish investors are not without hope, because there are three catalysts on the horizon that have the potential to reverse this negative trend and send the stock rebounding. It has been nearly 16 months since Halliburton agreed to acquire Baker Hughes in a $35 billion cash-and-stock deal. The deal has yet to close because regulators fear that it will stifle competition in the oil-field service sector by widening the gap between the top tier players and the next tier down. To alleviate these fears Halliburton has proposed a number of asset divestiture plans, but none of those plans have changed regulators' minds. Undaunted, Halliburton has recently put together a new plan to sell overlapping business lines, including Baker Hughes' offshore drilling-and-completions fluids division and most of its completion systems as well as a couple of other units. If this new proposal does the trick and regulators approve the deal, then it would lift a huge weight on Halliburton's stock price. From the 2014 peak, our completions-related activity declined approximately 33% relative to a 64% reduction in the U.S. land rig count. This clearly again demonstrates the customer flight to quality that has emerged during this downturn. Halliburton has already aligned itself with customers that have the strongest balance sheets and the best acreage in shale basins. One reason its customers are choosing to give more of their business to Halliburton during the downturn is because it is "collaborating with them on ways to lower their cost per BOE to a place where we can both be successful," according to President Jeff Miller. What this suggests is that there's a potential for Halliburton to win additional market share from its weaker peers during the downturn because its focus is on saving its customers money. If these market-share wins continue and begin to drive some incremental improvement to earnings, it could give investors a reason to cheer. Because of this correlation, Halliburton's stock should rally if the oil price rebounds because of the implied increase in oil-field service volumes. While there are a number of near-term drags on the price of oil, there are two things that could fuel a big rally in the oil price. First, there is increasing talk that OPEC and non-producers are ready to make a deal to reduce output. Russia, for example, is reportedly talking with Venezuela about a coordinated cut, while Nigeria's oil minister recently said that the mood inside OPEC is shifting toward propping up the oil price instead of being concerned with market share. In addition to this, steep capex cuts in North America are starting to lead to meaningful production declines. Because the main pressure on the price of oil right now is supply related, if OPEC does cut its output and production declines take hold, then oil could rocket higher and take everything oil-related up with it. Halliburton's stock price has been pummeled by the downturn in the oil sector as well as by worries that the Baker Hughes deal will collapse. That said, once these worries abate, it should lift a big weight off the stock price and send it higher. Likewise, if the company can continue to win more of its customers' business by working with them to lower their costs, that could also be a catalyst for the company. In other words, times might be tough right now, and could get tougher, but there are catalysts on the horizon that could cause Halliburton stock to reverse course and head higher.